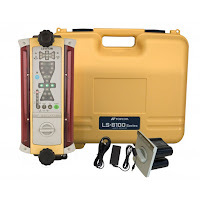 The LS-B110W is a Laser Sensor with a Wireless Remote Display. It is loaded with all the time saving features as the other LS-B units and also perfect for your larger machines where the Sensor is out of view. This equipment offers the total solution in grade management. With the one touch "On Grade" matching, MC automatic capability and built-in Plumb and Slope Indicator, you can't go wrong. Put the LS-B110W on your Dozer, then move it to your Scraper and then onto your Excavator. This equipment does it all on virtually all your machines. With the added Slope and Plumb Indicators, your grading and excavating accuracies are tighter than ever with Topcon's LS-B110. Plus, the new LS-B110 enables you to offset the "on-grade" position with one touch. This gives you an even greater working range. Compatible with Topcon's family of Control Boxes for all your earth moving equipment the LS-B110 can also be used in "automatic" mode to-hydraulically control the elevation and/or the slope of the cutting edge. This takes your production and materials savings up to a whole new level. Looking for a great value on a Laser Sensor for your earth moving machines? Check out the LS-B100. Fast to set up and easy to use, this affordable depth control sensor can be mounted to your equipment and working within minutes. This unit is packed full of features such as an Accuracy Mode and Battery Life Indicator. Plus, it has a Power Save/Auto Cut Off function to save your battery life. The LS-B100 is a low-cost grade indicate solution that makes any operator more productive. The Remote Display puts the Laser Sensors information in the cab of the machine. Productivity increases on the job because the operator focuses on the grade information and not the Sensor itself. The operator can adjust the "On Grade" position without leaving the seat. No need to climb down to adjust the laser height or move the Sensor on the machine. Whether you are going deep with your excavator or grading with a drag scraper the RD-100W is wirelessly connected to the LS-B110W giving the operator constant, real time grade information.